Dawn breaks over Peking with the sun burning holes through the low-lying smog, and at 4:30am there are already several in the car park up and about, packing items away for the start, Dutchman Etienne Veen is fussing over his car but he has the lightest luggage of the lot, despite having one of the biggest cars with a vintage Mercedes 630K - anxious to keep weight to a minimum all his luggage from his hotel room to rear of car was one easy swing onto the backseat of a single shoulder bag. Etienne's approach is a total contrast with all the others, who spend an hour in the car park stuffing and stowing all manner of items and several cars give all the appearance of being so heavily loaded the rear springs are sagging before they have the chance of hitting the sleeping-policemen at the bottom of the drive. Everyone else in Peking who is not involved in the Great Race also sleeps on, and the rally rumbles out of town's he car park is empty before 6.0am. First-car is not due to be flagged away until 8.30, but such is the eager anticipation to get on the road we all leave the hotel with plenty of time to spare. The informal and un-timed run to the Great Wall at Badaling is a 40 km sweep up the main expressway and makes no great demands these days - back in 1907, it took Prince Borghese and his rivals a full day of heaving and pushing over polished marbled bridges, using bamboo canes to measure the width of goat tracks to ensure a car could squeeze between rock faces, and all had to bounce over enormous boulders of a river bed, tackling a course that would make any Camel Trophy-hunter blanch. This is easy-peasy, 100 years on. Nobody gets their wooden wheels sucked into mud, and, joy of joys, it is not raining. Several find themselves on the hard-shoulder, however. We quickly come across David and Sadie Williams in the bright green Chevrolet Fangio Coupe, bonnet up, and David fuming over electrics, or is it over-heating, but he is soon mobile again. Climbing up the hills to Badaling sees others experience similar teething problems, and by now it is clearly going to a bright sunny day with temperatures rapidly soaring. Several engines are complaining of the heat, and the day has hardly started. The send off from the Great Wall proves a colourful and noisy affair of umpteen cymbals, giant drums, dancers dressed as dragons, others on stilts, along with hoards of excited children, mystified locals cheering and clapping, mixing in with 70 press cameramen who force their way to the giant Blanc Pain watch standing tall at the top of a white pillar emblazoned with the word START. David and Karen Ayre take up position with Jonathan Turner and Adam Hartley inches behind, both Itala's then anointing the spot by leaking large puddles of oil onto the 2,000-year-old stone slabs, staining a permanent memorial to the fact that 100 years ago an Itala setting out for Paris did exactly the same thing. Everyone made it to line up and is flagged away on their correct minute and the Peking to Paris at last is now officially underway?first obstacle being to inch past the toes of a heaving and pushing press mob of eager photographers and film crews. The run to Datong - capital of a coal-mining region but being Sunday we have had an easy time of the roads with very few trucks ?has been only eventful by the number of breakdowns. 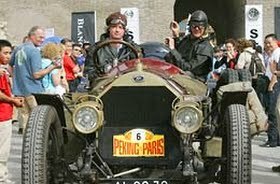 First casualty was car 6, the lovely-looking low-riding Knox Tyre R (picture above at the Great Wall start) of Michel Laaman and Antonius Poelsma, Dutchmen looking to seek revenge for Charles Goddard who a hundred years ago failed to beat Prince Borghese with a Dutch Spyker. With separate cylinders, and exposed valve gear, their engine is captivating to look at, but by mid-afternoon had decided to let go with a loud bang. We came across Michel talking Chinese to a bunch of children who wanted to know why he had stopped by the roadside. He looked utterly gutted and totally choked off, a cylinder having split from the bottom of the crankcase with such force you could see the piston's connecting rod. There was just a single loud bang, and we knew right away this was mighty serious. A black police car carried him off into town to find someone who could truck the 1911-age car back to Beijing. Other mechanical woes today have not been so terminal, but numerous crews have suffered problems of dirt in petrol blocking fuel filters. You need a big glass jar of the truck variety for these sort of ventures, and the tiny plastic fuel filters commonly used just don't seem man enough for the job. The four-litre Singer tourer of Wilhemus Van Gemert and Johan de Swart stopped with a coughing fit, and all attempts to move up a long hill only provoked more splutters. They were not alone, the Bentley Le Mans of Mark and Jocelyn Seligman must have picked up the same batch of dodgy fuel and also came to a stop with blocked fuel lines. 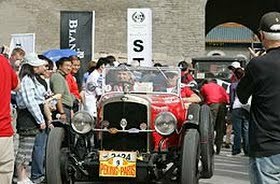 The Sunbeam 16, a large yellow vintage saloon, has stopped outside Datong with axle drive-shaft problems - this sounds worrying - and the sweeper teams of mobile workshops are now on the case. Today has been an easy run via the hanging monastery that dramatically clings to the cliff face at Hunyuan. Crews had nothing more demanding made of them today than having to aim at collecting a stamp as proof of passage at the Passage Control checkpoint here, and get to Datong on time. How easy it's been for all, with relaxed timing demands, is reflected in the results, and apart from rippled tarmac caused by constant pounding of coal trucks, its been an undemanding road as we all settle in with today's hot but gentle shake-down. Cars arriving into the large concrete hotel overlooking the compound just off the main street are being greeted by the pomp of a military brass band, where every player seems to be competing to see who can make the loudest noise. 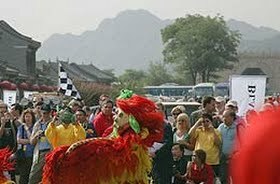 This, it seems, is proving just a touch more competitive than rallying out of Peking - and in this heat almost as exhausting.